Data is from the March 2015 Interactive Advertising Bureau (IAB) Mobile Marketing Center of Excellence report titled "Marketer Perceptions of Mobile Advertising - Third Edition" conducted by Ovum. 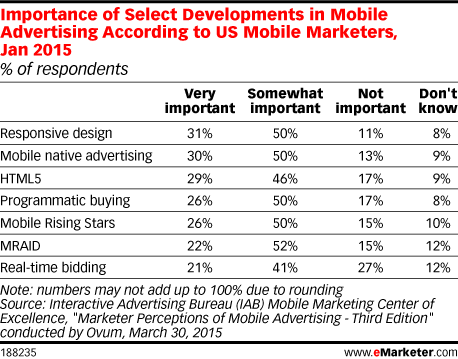 Marketing executives at 200 US organizations that use mobile advertising were surveyed during December 2014-January 2015. Of the companies surveyed, 43% have annual revenues of over $500 million, 28% of between $101-$500 million and 30% of $100 million or less. Respondents either had final decision-making authority for some/all mobile marketing requirements, or influenced some/all mobile marketing decisions.